Weighty Matters: Canadian Diabetes Association Health-Washes 7.25tsp of Sugar Per Glass! 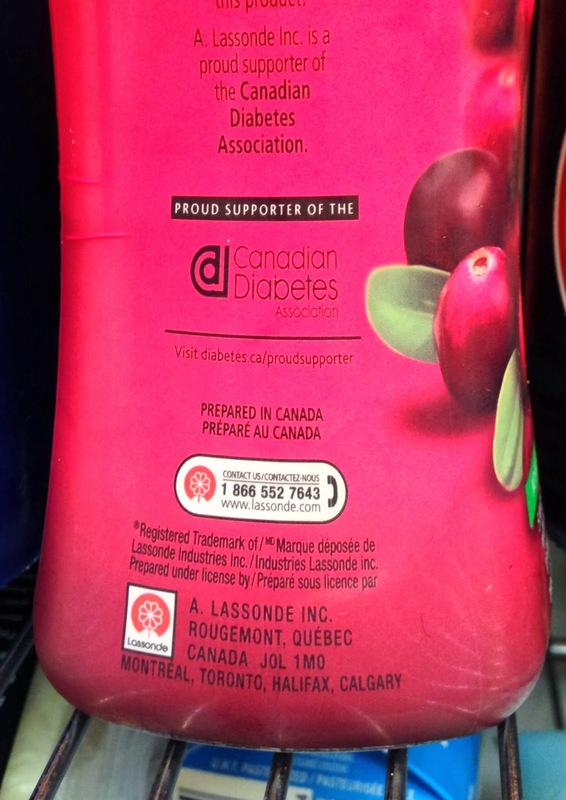 Canadian Diabetes Association Health-Washes 7.25tsp of Sugar Per Glass! Though I can't say I was shocked, I can say I was horrified when while visiting my parents this past weekend I opened their fridge only to find the Canadian Diabetes Association's (CDA) logo emblazoned on the side of an already insanely health-washed bottle of Lassonde's Oasis "Cranberry Antioxia" (and no, "antioxia" is not a typo). Like all such beverages Oasis Cranberry Antioxia is basically sugar water. The first ingredient is water. The second, third, fourth, and fifth, for all intents and purposes, are sugar in that they're "fruit juice concentrates" because when you concentrate a juice, you're left with a heaping pile of sugar, which in the case of Oasis Cranberry Antioxia amounts to 7.25 teaspoons of sugar per glass. While 7.25tsp of sugar a glass is a bad plan for anyone, and even a smidge more than you'd get in an equivalently sized glass of Coca-Cola, it'd be an especially poor choice for a diabetic. And yet, there's the CDA's logo on the bottle. While I'm only guessing, it would seem it's there because the CDA thinks money is more important than integrity or health as the fine print just above the horrifically ironic inclusion of their logo on a glass of sugar water reports that Lassonde's Oasis is a "proud supporter" of the CDA. And given Lassonde's Oasis product repertoire I think it's totally fitting for them to give money to the CDA, but at the cost of this sugary co-branding I would have hoped that the incredibly minute amount of wisdom required to see these as ill gotten gains, would be possessed by someone over at the CDA. Guess I'd have been wrong.